What can I say about the first ten day residential retreat in Ireland? How can I thank all involved for their incredible hospitality and professional service? Certainly a short update here doesn’t do anything to honour an event that workshop participants, the various hosts and the amazing venue made so special. I’m not going to post anything more today except this shot of us with Philip Cushen at Cushendale Woollen Mill. I promise faithfully that I’ll write a proper review of the retreat as soon as Kilkenny Arts Festival is over then post it here with copious pictures!!! For now though I’m in the final throes of installing my solo exhibition at Grennan Mill Craft School as well as collating what I need to deliver to Kilkenny as part of the FORM pop up shop. Both these events open on Friday so I’ve not got much time to get everything finished! Thank you so much to Naomi, Merridee and Keith for all your help preparing for Grennan, I’ll post properly about the show at the end of August. Exhibition wrap up, preparation for Chrissie and Nigel’s arrival and please vote for Dawn! Yesterday evening our 10 days exhibiting at Grennan Mill Craft School was over. I had such fun over the last two weeks, spending time with Alex (director of the craft school), the other artists and everybody helping them set up and invigilate the show, I think we all had a ball! Welcoming visitors to the ground floor space Clive Nunn had a wonderful exhibition exploring his journey through Irish furniture over the last 30 years. It was fascinating to read his story boards and see examples of venacular furniture side by side with the stylish modern designs that he now makes to commission from his studio a stones throw down the road from Grennan. Moving up the stairs to the mezzanine gallery, Trini Kenny’s amazing batics drew gasps of admiration from all our visitors and many people were tempted to put their hands in their pockets and bring one of these beautiful framed pieces home with them. My work was on this level too in the first floor gallery and two flights of stairs higher saw wonderful leather work from Brendan Brennan and an amazing photography exhibition from Kirsty O’Keeffe. Finally up a further two flights of stairs to the top floor gallery where Maire Gartland had a fabulous exhibition of paintings and beautiful hand made books. This is the largest gallery in the mill and Maire’s work really showed off the space to the best advantage. The public appreciated her work too and it was great to see people not afraid to invest in a bigger piece of art, some of the canvases were huge! I was very happy to sell 4 of my vessels and 4 framed seascapes. It was good too to get a comission for another framed piece and potentially 2 more comissions for small vessels, fingers crossed they both pan out. Many visitors are interested in felting workshops so all in all it was a very successful experience for me sharing my work and meeting other like minded individuals! Today I have been battling in my kitchen and other areas of the house in preparation for Chrissie and Nigel Day’s arrival on Thursday. Most of you probably know by now that the wonderful Dawn Edwards and I both attended the same university of housework, unfortunately I was a dropout so there really is a LOT of work to get done before Chrissie and I have our launch party for ‘From Felt to Friendship’ next Saturday!!! Speaking of Dawn, please, please, please head on over HERE, check out her amazing hat and vote for her if you would like to see a fellow felter win the design opportunity of a lifetime. She needs 100s of you to click that vote button so don’t be shy, the leader at the moment has over 1000 votes so let’s see if the power of our textile network can really push Dawn up that list fast, there are only 2 days left!!! It’s been very interesting and revealing invigilating at Grennan Mill Craft School, each of the 6 artists needs to either man the show for 3 full days or 6 half ones, I have chosen to do 3 full days. If I wanted I could nominate someone else to do my stints but for me a lot of the pleasure at this stage of the process is to meet the public and see how people engage with all the work on display. It has become increasingly obvious as the days go by that people either love the felt or hate it (maybe hate is too strong a word! ), there doesn’t seem to be any middle ground at all. 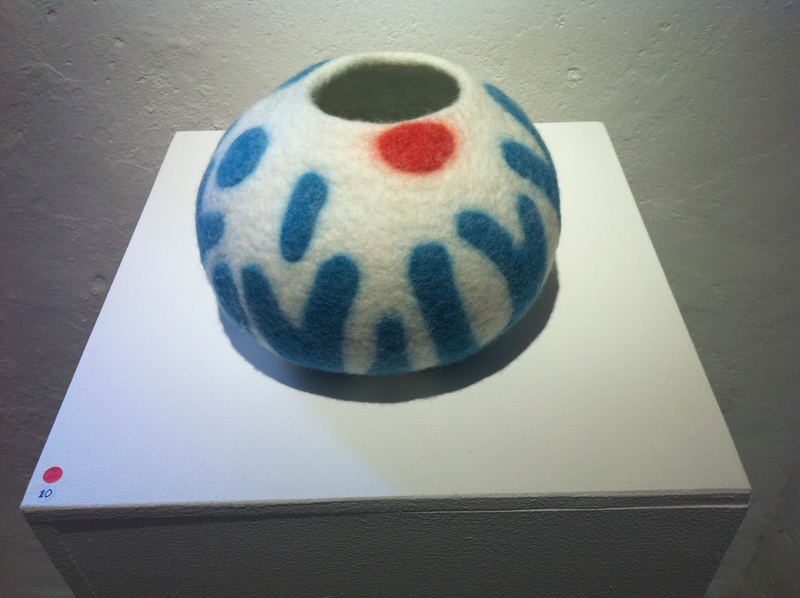 I love watching everyone’s expressions when they first enter my space, many people are totally surprised when they discover the vessels and sculptures are wool, they know that they appear tactile but they often think that they are ceramic none the less! It has also been interesting to discover that even if people do like these non functional pieces they may not have a place in their homes to display them. 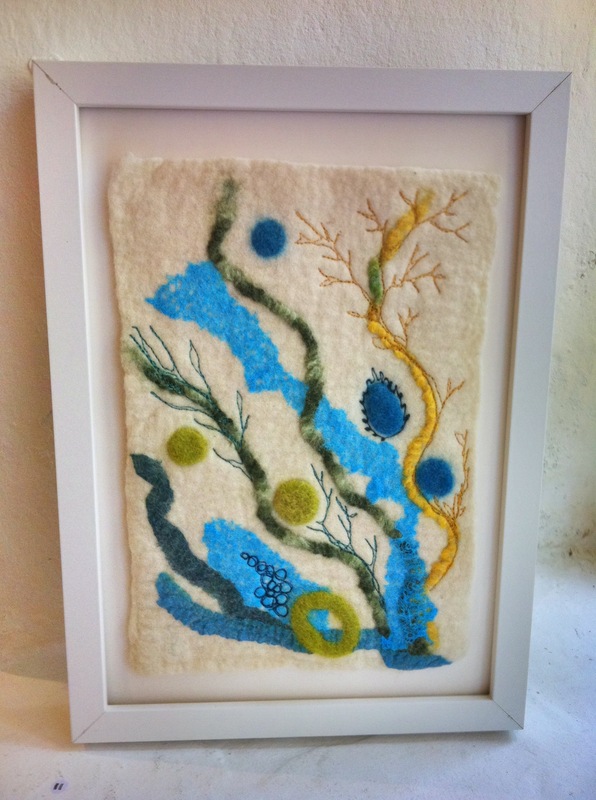 After I sold my only stitched seascape on the first day several people said that they were interested in hanging this type of work in their home, in fact I actually got a commission for a framed piece during the course of the opening evening. As a result of this I decided to spend Monday and Tuesday working and finishing some more wall pieces, I framed them yesterday morning at Grennan and two of the four sold during the day, actions speak louder than words sometimes! Today I spent a lovely time at Carmen’s with her and an Argentinian fibre friend Patricia, we started with a big breakfast, felted all morning, had a delicious stew for lunch and then stuffed ourselves on pancakes before more fibre related fun in the afternoon!!! Getting totally away from vessels and seascapes for the day I planned and felted a large wrap using some of the beautiful silk my Auburn friend Merridee dyed for me at The Tin Thimble in Loomis, CA recently. This was an experiment using the tumble dryer method, a technique I want to work on further before offering it as an option for workshops but this might be a good time to say that it entails NO rubbing or rolling making it perfect for larger projects and anyone who might find the methodology of traditional nuno a little time-consuming or dare I say it even boring! I would like to stress though that I don’t find rubbing and rolling boring, relaxing and therapeutic would be my personal take on this process but I suppose it’s horses for courses isn’t it and who doesn’t want to make a larger piece but with a lot of the effort removed and in a fraction of the time??? I’m not going to blog further about this method until I have fine tuned my timing but I will definitely include a couple of projects in the next book Chrissie and I are publishing (nuno clothing, out before Christmas! ), for now here is a picture of todays finished wrap. This morning I made the final adjustments to my space at Grennan Mill Craft School and decided enough was enough, 7 vessels, 2 sculptures and 1 framed piece with a little free machine embroidery. It’s always nerve wracking but exciting participating in any show and since this is actually my first solo exhibition the stress and worries about the felt I am showing and how the work is displayed are amplified about a thousand fold! Alan was brilliant setting up smart little spot lights on industrial looking tracks for me and Eileen’s plinths look great now that I have given them another couple of coats of paint. The little holes in the wall are all filled in and painted again as is the radiator and this morning I finished cutting up hundreds of business cards which I printed last night, of course if my house and studio were tidy and organised it would be possible to locate my beautiful professional cards which are just lurking somewhere in all their pristine glory, that’s another story!!! Fellow exhibitior Brendan Brennan and I helped Grennan Mill director extrodinare Alex Meldrum put up directional signs in Thomastown and now all our fingers are crossed for warm weather tomorrow afternoon to get everybody in a good mood for the official opening at 5.30! I’ll try and take some pictures then but hopefully we’ll be run off our feet and they might have to wait until another day. I’m delighted to say that I am still in the top 10 for the latest Wikio knitting blog rankings, here is the sneak preview for this month ….. 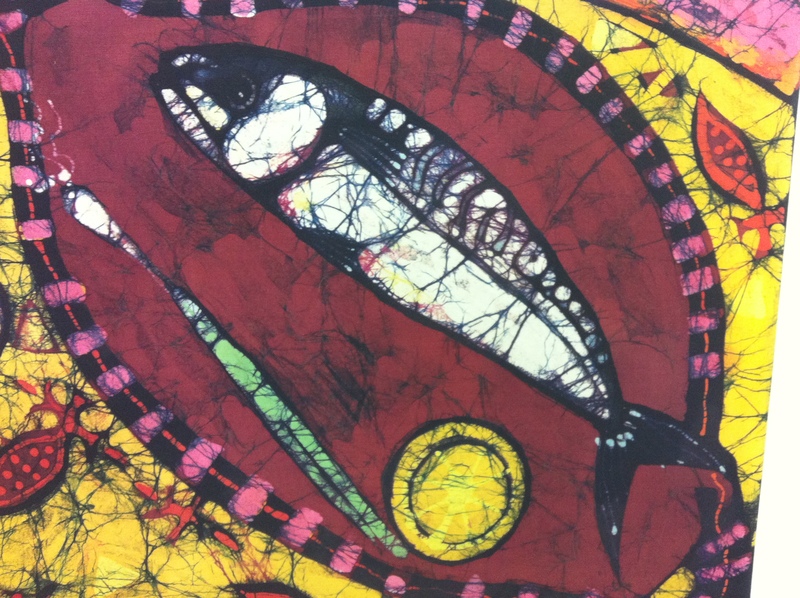 I have been flat out this week trying to finish my work for Kilkenny Arts Festival which opens next weekend. Most of my pieces are totally wet felted but a couple have some free machine embroidery to add surface detail, I know, I can’t believe I am actually writing that! The exhibition takes place in Grennan Mill Craft School, Thomastown and I am one of 6 individual artists who all have solo shows under one roof, the setting utilises the various floors of a wonderful grain mill poised on the banks of the river Nore. For anyone within striking distance of Thomastown please do call in during the exhibition and say hi, I will be envigilating on some days (not sure when yet) so if you are interested in meeting up please do email me in advance and I can let you know my schedual!!! Apologies to those of you waiting for the final review of the new printing techniques I learnt at Felt in Focus, it is going to be a week or so before I can really relax and get stuck into writing posts properly! Yesterday afternoon I was just able to grab an hour and a half to try out a felt hat as an experiment with the Icelandic wool. Some of you have been asking how coarse the wool is and is it suitable for wearables, in her book ‘Uniquely Felt’ American fibre artist Christine White classifies Icelandic wool in the medium and long wool section with a Bradford Count of 46-52s and a micron count of 32-28. To my mind this makes it perfect for creating sculptural felt hats ideally suited to a colder climate. For my experiment yesterday (still to be rinsed and shaped again this morning) I decided not to use any merino on the inside, this would probably make the lining softer but to be honest when I tried the hat on yesterday evening it felt great, not a bit scratchy! I slightly altered a bag resist that I already had to use as a template and then spent some time studying books by Chad Alice Hagen, Christine White and Lizzie Houghton to determine exactly how much wool to use. Because I really am a beginner when it comes to hats (unlike my friend Dawn Edwards!) it did amaze me how little wool I needed to use to create a beautifully strong but flexible hat, just 80g in total for this model. 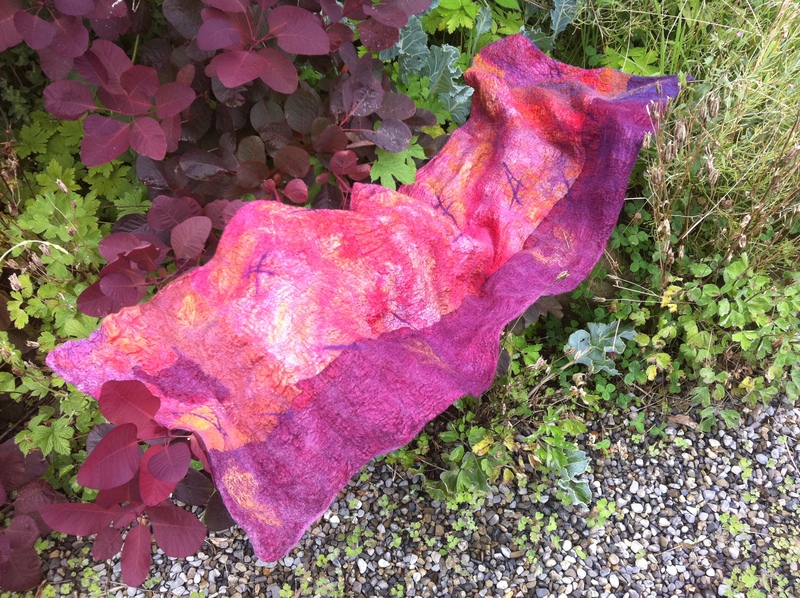 The raspberry coloured Icelandic is a very rich colour and I was lucky to find a matching piece of scrim in my stash that I had made in a week long batik course with Alex Meldrum at the Grennan Mill Craft School in Thomastown. I didn’t want to embellish the wool too much but did want to see how a little bit of fabric would add or detract from the final look of the hat. The whole project was really quick and simple to get to this stage although I am going to alter the template slightly this morning and have another go with some different colours. I love the way the wool is still soft and flexible but appears to hold the structure well. This is the first time that I have used my hat block (it has been sitting gathering dust in my studio) and it did make the shaping into these rings pretty easy, I am not sure however how well I would be able to create other shapes, time will tell! I also like the surface texture of the hat as shown in the detailed picture, the scrim felted in to the wool very well and there is a very nice tactile feel to the whole thing. I may shave inside the band where the wool will come in contact with my head although the jury is still out on this but otherwise I think I will leave the outside surface ‘au natural’! If any of you are interested in trying out some Icelandic wool it is now available from my new Etsy shop. I hope to prepare some felting kits before the weekend and will let you know as soon as these come on stream. Off now to rinse and finish the hat, more tomorrow!